BIRMINGHAM Ala. 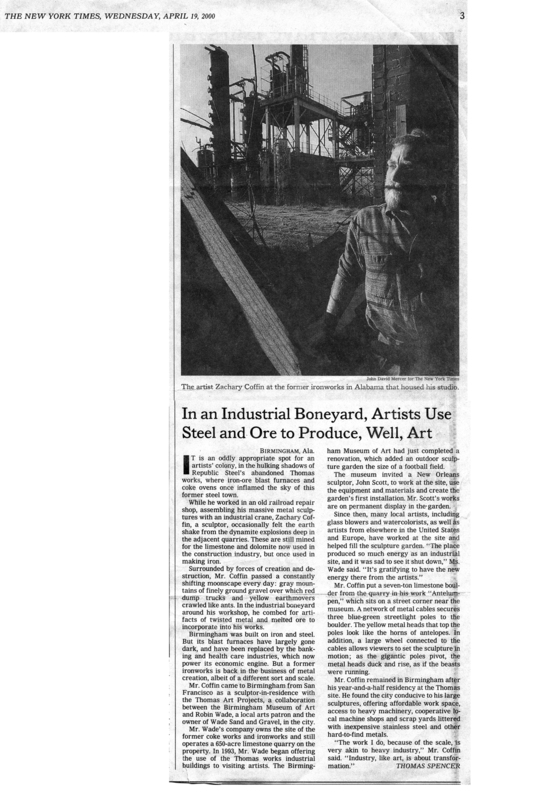 It is an oddly appropriate spot for an artists’ colony, in the hulking shadows of Republic Steel’s abandoned Thomas works, where iron-ore blast furnaces and coke ovens once inflamed the sky of this former steel town. While he worked in an old railroad repair shop, assembling his massive metal sculptures with an industrial crane, Zachary Coffin, a sculptor, occasionally felt the earth shake from dynamic explosions deep in the adjacent quarries. These are still mined for the limestone and dolomite now used in the construction industry, but once used in making iron. Surrounded by forces of creation and destruction, Mr. Coffin passed a constantly shifting moonscape every day: gray mountains of finely ground gravel over which red dump trucks and yellow earthmovers crawled like ants. In the industrial boneyard around his workshop, he combed for artifacts of twisted metal and melted ore to incorporate into is works. Birmingham was built on iron and steel. But its blast furnaces have largely gone dark, and have been replaced by the banking and health care industries, which now power its economic engine. But a former ironworks is back in the business of metal creation, albeit of a different sort and scale. Mr. Coffin came to Birmingham from San Francisco as a sculptor-in-residence with the Thomas Art Projects, a collaboration between the Birmingham Museum of Art and Robin Wade, a local arts patron and the owner of Wade Sand and Gravel, in the city. Mr. Wade’s company owns the site of the former coke works and ironworks and still operates a 650-acre limestone quarry on the property. In 1993, Mr. Wade began offering the use of the Thomas works industrial buildings to visiting artists. The Birmingham Museum of Art had just completed a renovation, which added an outdoor sculpture garden the size of a football field. The museum invited a New Orleans sculptor, John Scott, to work at the site, use the equipment and materials and create the garden’s first installation. Mr. Scott’s works are on permanent display in the garden. Mr. Coffin put a seven-ton limestone boulder from the quarry in his work “Antelumpen,” which sits on a street corner near the museum. A network of metal cables secures three blue-green streetlight poles to the boulder. The yellow metal heads that top the poles look like the horns of antelopes. In addition, a large wheel connected to the cables allows viewers to set the sculpture in motion; as the gigantic poles pivot, the metal heads duck and rise, as if the beasts were running. Mr. Coffin remained in Birmingham after his year and half residency at the Thomas site. He found the city conducive to his large sculptures, offering affordable work space, access to heavy machinery, cooperative local machine shops and scrap yards littered with inexpensive stainless steel and other hard-to-find metals.